An Adult-Adult relationship between the mediator and client is important. An Adult-Adult relationship between a Mediator or other conflict resolution supporter and someone involved in a destructive conflict is essential if the conflict resolution is to be effective. This applies to anyone involved in a dispute, whether as someone trying to help others resolve their dispute or if it is our own. The Mediator is the facilitator of the resolution process and not a source of ‘expert advice’ or other input into the situation. This distinction is obviously a metaphor – some parents relate to their children in a very Adult-Adult way. The main point is that in the relationship there is not a dependency by one person on another for their needs to be met. All of us will move between these two types of relationship with various people we interact with in our lives but within mediation as a process it is an Underlying Philosophy that people are not relying on the Mediator to solve their problems for them. That is, the relationship is an equitable Adult-Adult one. People in dispute are considered to be the experts in their situation and therefore will be the experts in knowing what means of resolving a situation will work for them. Any practice that implies the mediator is the expert in solving their dispute for them changes their role to one of being the 'Parent' in a Parent-Child dynamic and is ultimately disempowering. This is is reflected in the Underlying Philosophy of Ownership - that people are inherently capable of, and responsible for resolving their own disputes and life situations. In many interactions between organisations and individuals however the nature of the relationship is more like Parent-Child, and as a result the destructive conflict situations will often become chronic and dependent. I have experienced agency officers phoning up on behalf of people they have referred for mediation instead of expecting them to call us themselves. The people they have referred are adults, what hinders them from calling us directly? The ongoing rescuing ethos practiced by many agencies, induces a Parent-Child relationship. Consider how much time is taken up by agencies doing this for adults across the country. This would promote an Adult-Adult relationship between themselves and the disputant as well as promote an Adult-Adult relationship between the disputant and the Mediation service. Perhaps their Managers would tell them off for not making a phone call for another adult? So is it the Managers in these agencies that perpetuate this? Or is it the local Councillors or MP’s who contact the Managers who contact the Officers as a result of the complaint from the resident that the officer didn’t call the Mediation Service on their behalf for them to find out what’s going on in their case? The point is, it isn't down to any one particular individual or role, it is a lack of awareness of the approach being one of Parent-child and so this permeates the policies, procedures and responses of the agency. Wherever the cycle starts, Rescuing is occurring, reflecting a Parent-Child dynamic in the relationship that exists between the client and the agencies and those that influence or monitor the agencies. How much time and effort and energy has gone into that situation? This is because the values of our organisations rarely encourage or support or expect adults to act as adults but intrinsically operate as if the relationship is that of Parent-Child. Some agency officers would say that some members of the public expect that of them or are not 'capable' of doing these things. Or their managers would expect it, or the local Councillors or MP’s would. They are exhibiting Rescuer Syndrome if they do say this and their actions not only serve to inhibit the resolution of, or even escalate, many disputes but they also use up an enormous amount of time and resources. There is more about this phenomenon on the Communication and Conflict in the Helping Professions page. An Adult-Adult relationship between someone in dispute and anyone who is trying to support them in resolving that dispute is essential if the support is to be effective. Whether that supporter is a mediator, or a friend, or colleague or family member, etc. A Parent-Child approach to supporting the person in dispute will not only entrench them in their 'victimhood' but will also create a dependency relationship between the person and the supporter. If you know of someone involved in a destructive conflict and you have become 'fed up' with trying to help them, the chances are that your approach has been more akin to a Parent-Child type of relationship in your support. But that's fine, because it's ok to make mistakes. Any mistake is an opportunity for learning. Are you willing to reconsider your approach, to use effective questioning skills rather than keep trying to come up with a solution for the person. As if they are not able to find one for themselves? 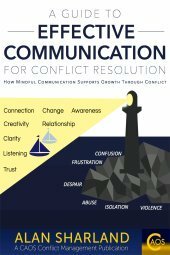 All of the Principles of Effective Communication reflect an Adult-Adult approach to communication and support its application to Conflict Resolution.